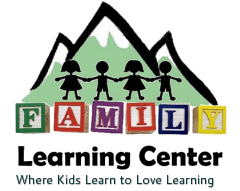 The Family Learning Center provides quality care and early childhood learning programs for children aged eight weeks to six years in the Edwards Eagle River Valley of Eagle County, Colorado. Tuition is charged below actual cost to be affordable for all families. In order to fulfill our mission we rely on the generosity of donors like you. The Family Learning Center is a 501 (c)(3) nonprofit organization. By contributing to the Family Learning Center, you have the unique opportunity to direct a significant portion of your Colorado Income Tax liability toward building a stronger community. We are a “qualified organization” for purposes of the Colorado Child Care Tax Credit, which provides you with a State tax credit at a rate of up to 50% of your cash donation. This is in addition to Federal and State tax deductions. The donations go directly to classroom supplies, specific programs and projects, the FLC Garden and to supplement the tuition of families in need.. The Family Learning Center appreciates the synergy of generosity from the community and current active contributors, that make the mission statement a reality everyday for the children of FLC. Every year we start the process over with new grants and finding donors. We are in need of new and “gently used” computers, children’s toys and furniture, books and art supplies. Please Contact Executive Director Michael Fox for more information regarding donations.